After taking a hot bath, you’ve probably had a feeling of refreshment that wasn’t just due to being clean. This feeling of calmness and weightlessness is caused by hydrotherapy, and when used with the right equipment and techniques, it can heal and recharge your body. Hydrotherapy, also called water therapy, is the use of water for therapeutic uses. Water at different temperatures, pressures and mixed with different substances all qualify as hydrotherapy. Physical therapists often employ hot tubs as equipment for various hydrotherapy techniques. So, what are the different types of hydrotherapy you can enjoy in your hot tub or spa? Many different techniques are used in hydrotherapy. Some are simple, like compressing your limbs in a cold, damp towel and drying them off and wrapping in a warm, dry towel. Though these practices are easy and can be done from home, the best results come from fully immersing yourself in warm water and having your body massaged by gentle water pressures. This is a form of water therapy where you get a massage while you’re submerged in water. Hot tub jets provide similar muscle stimulation to relax and stretch your muscles gently. By using a series of temperature changes, muscle inflammation and muscle soreness can decrease immensely. Timing should be considered when using contrast hydrotherapy, and your heat cycles should always end on a cold bath or rinse. Contrast hydrotherapy after a workout, for example, should start with cooling yourself with cold water or a cold pack for about 5 to 10 minutes. Then, you should sink into a hot tub to warm up your muscles again for about 20 minutes, at which point your pain should start to slip away. Finally, end the treatment with a cold shower lasting for another 5 to ten minutes. Keep in mind the water temperature used in this technique should be neither freezing or boiling, just use whatever temperatures are warm/chilling but still comfortable. The buoyancy of water reduces the stress of gravity on the human body. Using this principle, exercise within a hot tub is a very practical way to stay active for those who would have difficulty otherwise. Exercise in water gives a greater range of motion and involves less joint pain. Furthermore, stretching in a hot tub is very common for athletes to warm up their muscles and prevent injury during a strenuous workout. Even though meditation is not considered a physical type of hydrotherapy, it is still used widely as a form of pain relief. Hot tubs provide a quiet, soothing environment which encourages mental stability while performing a meditation. For example, in body scan meditation (also called progressive relaxation), your mind is focused on locating areas of the body which are tense or in pain and using the mind to let the pain or tension slip away. A post by Medical News Today notes that many practitioners tense then relax muscles to erase pain, while others visualize a healing wave washing over them. While in a hot tub, a good practice is to imagine the jets of the water scrubbing away any tension or pain your body has. In fact, nearly all forms of meditation can take place in a hot tub, which provides calmness and a place of physical comfort. Hydrotherapy is used as a method of physical therapy and can help to treat several medical issues including arthritis and fibromyalgia. Joint and muscle pain seem to fade away in a hot tub and reduce tension over your entire body after using a spa. Headaches and cold symptoms can sometimes be remedied with a spa due to increased circulation and steam helping sinuses with warmth and humidity. However, if you have conditions such as heart disease, fever, or are pregnant, consult with your doctor before using a hot tub. 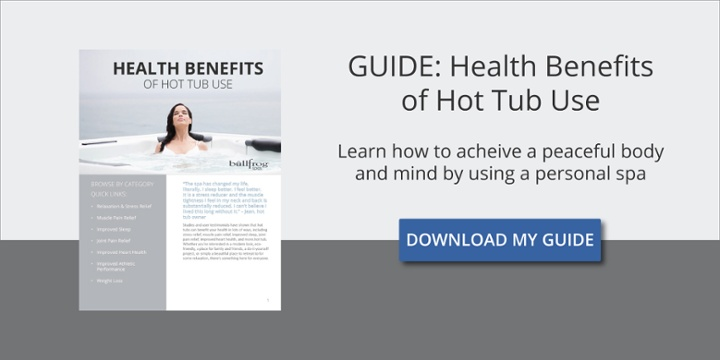 How Can I Use My Hot Tub for Hydrotherapy? Using a hot tub in the evening is a wonderful way to prep for bed. Warm water treatment cools your body’s core temperature, sending sleep signals to the brain. Massage from water jets erases or hampers any aches which spring up in the middle of the night, allowing for a deep sleep. By far the greatest advantage of these types of hydrotherapy in a hot tub is the peace and rest it offers. Stress causes far too many illnesses in America than it should, and taking a soak in a hot tub is the best medicine to let go of stress.